Herbs have always played an important role in mankind's history since before the written word was invented. They have had roles in superstitions, health, religion, love, romance, and politics. For instance the Abyssinians used to stuff their pillows with celery, and the ancient Romans and Greeks would make crowns out of laurel and dill for their heroes. The Romans also used dill to purify the air in their eating halls. Before the advent of medicine, herbs that could cure or ease common ailments were thought to be magical. The early American settlers brought many herbs with them from Europe for a variety of reasons including flavoring their cooking, burning as incense, and as herbal remedies for various illnesses. In the early pioneer days just about every home had an essential herb garden planted in a sunny corner so that fresh herbs would always be readily on hand for the homemaker. For many of us today, this tradition still holds true! With supermarkets in every town stocking every herb and spice available, the importance of growing herbs in modern society has dropped significantly. These days starting herb gardens is more of a hobby than a requirement for many of us, but the reasons why we grow them today haven't changed all that much over the centuries. 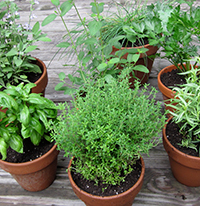 We grow herbs for a variety of reasons, but the most common are culinary, medicinal, ornamental, and aromatic. Someone who is truly a connoisseur has a wide range of herbs to choose from to add to their garden, ranging from every day herbs to ones that are not commonly found on store shelves. Culinary herbs are by far the most popular and most commonly grown because they have such a wide range of uses in any kitchen. Most of these herbs tend to be very potent in flavor so they are typically used in small amounts. This is great for the homeowner who may want to have an herb garden on hand, but doesn't have the time or desire to tend to a large garden. Among the most popular culinary herps are parsley, sage, basil, chives, thyme, marjoram, and savory. Aromatic herbs are less popular than culinary herbs, but are no less important. Most of the herbs that fall into this category will either have flowers and leave that give off very pleasant scents, or the plant itself will have natural oils that can be used in perfumes and other scented products. When dried, these herbs often find their way into incense and potpourri mixes because they retain their smell for a very long time. Among the more common herbs that are grown for aromatic purposes are basil, rosemary, lovage, marjoram, and various mints. Some herbs are grown purely for their beauty as a plant themselves. These will often have brightly colored blooms of leaves in addition to any aroma they might give off. Growing herbs for ornamental purposes often find their way into cut flower arrangements because they not only add beauty, but they also give off sweet smells which are highly desirable with cut flowers arrangements. 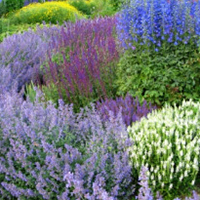 Some good examples of herbs that are often grown for their ornamental value are lavender, with it purple-pink blossoms, valerian with its crimson red blooms, borage and chicory for their blues, not to mention variegated thymes, mints, and chives. If you are considering growing herbs for medicinal purposes, you should be extremely careful and be sure to consult your doctor prior to starting any herbal remedy, to make sure it is the right course of action for you. Mankind has used herbs for thousands of years because some do in fact have medicinal properties; however you need to be careful because many of the perceived healing properties of a lot of herbs are vastly overrated. Some herbs are also extremely dangerous if eaten so before you go down that route please, please, please do your research and make sure you understand the health considerations of what you are growing. If you are just starting out with your first herb garden, you might find it a little overwhelming, trying to decide which herbs to grow and what uses they have. The first thing you need to learn about herbs is some of them are annuals, meaning that you will plant them and harvest them in the same growing season because they will die off over winter. Some are biennials, meaning that they will live for two seasons and will only bloom on the second season before dying off. Then the rest are perennials which means once they have established in your garden, they will return each year and bloom barring any extraordinary conditions. Once you have decided that you are interested in growing herbs, you then have to decide how big, or small, of an herb garden you want to grow. The biggest limiting factor in this decision is really your own ability and ambition for tending the garden. If you make the garden too big, you are likely to get overwhelmed by the amount of work it will require and you could lose interest. 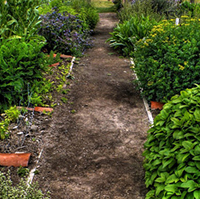 Start small for your first couple herb gardens and work up from there once you have a strong idea of what is entailed. Make sure you give your herbs the proper soil conditions as well or so much of your hard work will be wasted in lackluster plants that aren't reaching their full potential. 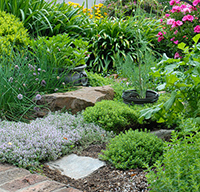 Herbs do not like soil that is constantly damp, so making sure you have adequate drainage is essential. If the existing soil is just not up to the task, then consider building raised garden beds on top of the ground where you can control the growing conditions more readily. 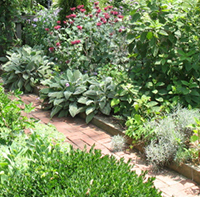 We have some great articles on how to start raised garden beds.